cuts out clog uppers of leather, by hand or machine; in case of hand work, cuts out uppers with sharp knife, according to metal pattern laid on leather. makes clogs throughout by hand; cuts sole, makes upper, and nails it to sole, i.e. 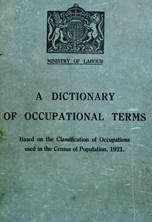 combines occupations of sole cutter (498) and of clog seatsman q.v. ; term also frequently used as synonym for either. cuts ornamental patterns, by hand, on leather uppers of clogs. tacks uppers on to last and hammers out, while wet, to shape; usually done by seatsman q.v. closes leather uppers of clogs by power machine; as for closer (414). cuts out and makes upper of leather, by skivering edges and stitching seams by hand or sewing machine, or by riveting; attaches sole thereto by closely nailing a strip of leather along overlap of upper and edge of sole, and finishes clog; repairs dogs; sometimes also does work of dog clasper (429) q.v. thins edges of leather where it overlaps in closing uppers of clogs, by paring with a knife by hand or in a machine; sometimes done by clicker q.v. in small works.